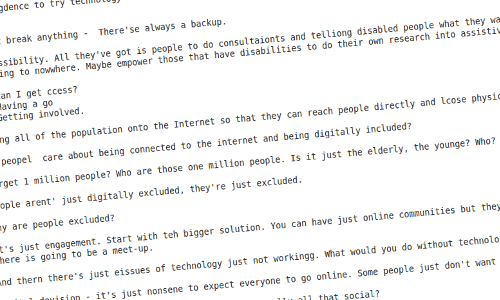 On Saturday I went along to the Digital Inclusion Unconference hosted by We Share Stuff. I went there tot try and gain more ideas for fizzPOP as part of it is about getting new people in who may not have otherwise dabbled with technology. Although there are government plans afoot to get more people online in some way (access to TV, PC or mobile phone Internet access) does that mean someone is digitally included? Is it measured by the amount of comments people leave on blogs or if they even have a blog or Internet presence? What does digital mean anyway? Most of the things in my kitchen are in some way digital, so does that mean I’m somehow more digitally included than my neighbour? Also, what about those who just simply have no desire to go onto the Internet? For me, digital inclusion is first about inclusion and then about the technology second. For example, having a hyperlocal blog doesn’t mean that suddenly all of the community will start to become active members. However, these are just one aspect to encourage inclusion. The second discussion that caught my attention was the one about open source software. Possibly before the inception of Linux there’s been an ongoing effort to get more people to use open source software and for more manufactures to supply products that use it. What we were discussing in this session focussed on the benefits to individuals, commercial companies and voluntary organisations. We also tried to highlight success stories. What was interesting to hear was the reasons that they haven’t changed over to using open source software. Many have switched to Firefox/Chrome or OpenOffice already either because it’s faster and has more features than the commercial alternative or because it’s free. For some the move to OpenOffice was spurned by it’s cost but also out of frustration of the new Microsoft Word 2007 interface and native .docx format, which was initially unreadable by anything other than the 2007 package. Of course there are technical reasons for not moving to open source. Sometimes it’s incompatible with hardware and, unless you buy a preconfigured system, there’s never any guarantee that all will work as expected (for example, on my Dell 155 laptop, after a time I cannot change the brightness of the screen). However, as with most technology it can only change and get better. No operating system is without its bugs. The main issue seems to be how to encourage a shift over to open source software.